The tractors lined up ready to go. 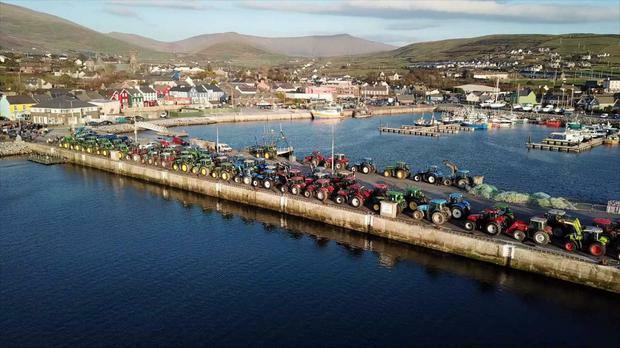 West Kerry doesn’t have a tradition of hosting tractor runs but recently the region welcomed 147 tractors in a special charity event that raised over €40,000 for local charities. Organiser JP O’Sullivan from Lispole in west Kerry tells the Farming Independent that he was diagnosed with pulmonary fibrosis in 2011 and that the only way he would survive was by receiving a transplant. “In August 2016 I got the call that I had a match and underwent surgery. I’ve had my ups and downs since but my life has been saved and I’ve gotten a second chance and wanted to give back to the incredible team at the Mater Hospital in Dublin and the ILFA,” he explains. JP says he wanted to hold a fundraiser in aid of the ILFA but wasn’t sure what to do since “every stunt” had been done in west Kerry before. “It wasn’t until I read an article in West Kerry Live magazine by local agricultural contractor Seamus Devane writing about the death of his wife Noreen and the great work local centre An Gardin Mhuire did for the family that I thought of a tractor run,” he says. A committee was set up consisting of locals and the date of November 25 was set to hold the tractor run. An auction was held the night before the main event in the Marina Bar in Dingle which raised €3,200. JP says the smashing weather on the day was the main reason for the great turnout of tractors that trundled from near Lispole over Mám na Gaoithe to Riasc and back to Dingle. The sea of tractors was captured by Ciaran Williams on his drone camera and gained international attention when the aerial video was posted on US news broadcaster ABC.